The MR110 operates like a VCR that records video onto memory cards instead of video tapes. The video record onto Memory Stick in MPEG-4 format is optimized for playback directly on a Sony PSP™. Enjoying your favorite video on-the-go has never been as easy before! Video iPod™ and other portable players can take advantage of this recorder too. To view video by iPod™ just transfer the video file to a Video iPod™ via iTunes. The MR110 also supports SD and CF memory card. Video that record onto a SD, CF card or Microdrive is virtually playable by all PMP, smartphone and PDA that has a SD or CF slot. With the MR110, you can create digital video from all your contents and view it on your portable player anytime and anywhere you want. That open new sources of video content for PSP™ and Video iPod™ users without limit to buying video programs in proprietary UMD discs from Sony or or downloading TV shows for a fee from a limited catalog. The MR110 has convenient interface to set up a scheduling record. You can setup maximum 6 recording programs at a time. The MR110 will start and stop recording automatically according to your pre-set time. No worry that you will miss any of your favorite TV programs. It's a versatile player too! Besides record video, the MR110 combines an MPEG-4 video player, photo viewer and MP3 music player in the compact unit. 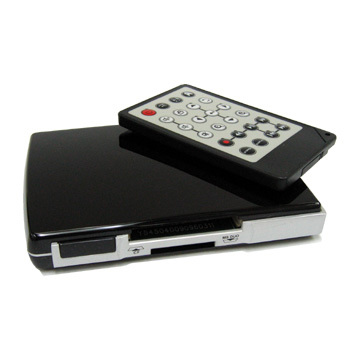 With its user-friendly remote control unit, it's easy to enjoy those contents with a TV set.